Process heater tubes of austenitic steel HP-40 grade employed in naphtha cracking plant at high temperature (950 0C to 1100 0C) were found to transform from non-magnetic to magnetic in two year of its service exposure. This paper discusses the genesis of magnetism in these tubes and correlates the magnetic properties with microstructural properties. Further, it also explores the feasibility of using magnetic technique as a suitable non-destructive evaluation technique for damage assessment of in-service components to avoid catastrophic failure. Detailed SEM and XRD analyses were conducted to correlate magnetic properties with microstructural degradation due to long term service exposure. In the petrochemical refinery units hydrocarbons are cracked inside the process heater tubes which are subjected at high temperature. During this processing carbon deposited inside the tube and slowly diffused into the inner wall of the tube. This diffused carbon produces carburised layer and makes the tube brittle, which leads the premature failure [1-2]. So there is a need to estimate the extent of carburisation of these in-service process heater tubes to prevent any catastrophic failure. Magnetic properties of steel changes with the carbon composition . So the magnetic techniques would have been a choice for monitoring carburisation depth . However, the material under study is non-magnetic in its virgin state although in-service component was found weakly magnetic. The objective of the present study is to understand the causes of magnetism in service exposed process heater tube and the feasibility of using magnetic method as a futuristic NDT tool for remaining life assessment of the tube by estimating extent of carburisation. These tubes were made of HP-40 grade steel with 25%Cr and 35%Ni as nominal composition at their virgin state. The tubes were used for naphtha cracking at 1100 °C for about 2 years. About 30-cm long and 7.3-cm outer diameter tubes one from virgin and one from service exposed were selected for the present study. The wall thickness of the virgin sample was 8.8 cm and the wall thickness of the service-exposed tube reduced to 8.2 cm. About 10mm thick rings were cut out from both virgin and service exposed tube for experimentation. 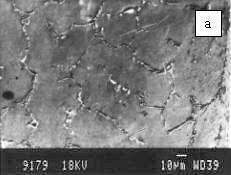 Optical micrograph of outer and inner surfaces of the service-exposed tube is shown in figure-1. The grain boundary carbide free region as indicated by an arrow mark, separated from the edge of inner (150mm) as well outer (250 mm) wall to the inside of the tube. In virgin tube, grain boundary carbide network started from the edges. Figures-2 (a) & (b) shows the microstructures of the virgin and service exposed samples. SEM-EDAX analysis reveals that the grain boundary Cr-rich carbides (Cr3C7) of the virgin sample transformed to coarser carbides (Cr23C6) after service exposure. Chromium depleted regions also detected by EDAX at inner and outer edges of the service exposed tube. 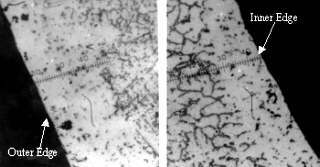 Fig 2: SEM Micrographs showing grain boundary carbides (Cr7C3) network in virgin tube (a) transformed to coarse carbides (Cr23C7) (b). To identify the carbides and the phases of the carbide free zones, X-ray diffractograms were taken and the phases are summarized in Fig-3 (a) and (b) for the virgin and service exposed samples respectively. The virgin sample showed Cr7C3 and NbC type carbides together with solid solution of Cr and Ni in g -Fe. Cr7C3 type carbides transformed to Cr23C6 type. This type of transformation was observed earlier [3-5]. Cr-, NiCr-, FeCr- oxides were formed at the outer most layer of the in service sample. The next thin layer of the sample becomes Cr2O3 and a very thin layer of MnFe- and MnCr- oxide was found at the inner edge of the tube. Fig 3: The phases at different locations of the tubes detected by XRD - (a) virgin tube (b) service exposed tube. Layer thickness is not drawn to the actual scale. In service exposed tube, the oxides at the outer surface was formed due to the exposure of the tube in air at high temperature (>1100 °C). The formation of Cr oxides decreased the Cr content at the outer layer of the tube and dissolution of carbides took place, which led to the grain boundary carbides free region near the outer surface. At the inner surface the diffused carbon from the naphtha cracking interact with the chromium and formed carbides and grew with the grain boundary carbides. After reaching a critical size the carbides came out from the surface as a metal dusting. 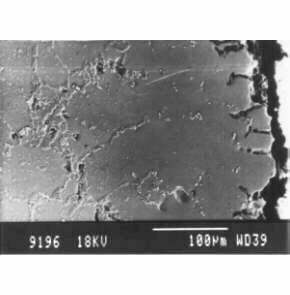 The existence of dusting was observed in SEM at the inner edge of the tube (figure- 4). The metal dusting and depletion of Cr led to the dissolution of near by carbides at the inner surface of the tube, which resulted to grain boundary carbide free region. Thus the oxidation at the outer surface and carburisation at the inner surface led the Cr depletion region near both the surface. The variation of Cr concentration in the matrix from outer to the inner edge of the service expose tube is shown in figure-5. It was found that Cr depletion was more at the outer surface. 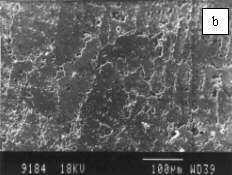 Fig 4: Microstructure of the service exposed tube from inner edge showing the sign of metal dusting. Fig 5: Chromium concentration profile in the matrix from outer to inner edge of the service exposed tube analyzed by EDAX. The virgin tube was non-magnetic. Hence, the magnetic properties were evaluated only on in-service tube. A hysteresis loop was plotted from the sample and is shown in figure 6(a). Hysteresis loop was also plotted [figure 6(b)] after removing 1-mm surface layer and ferromagnetic property was almost vanished. Fig 6: (a) Hysteresis loop obtained from the inner surface of the service exposed tube and (b) after removing 1-mm surface layer from inner surface. To understand the origin of magnetism, it is necessary to look the Fe-Ni-Cr phase diagram, which is shown in figure 7. The oxidation or carburisation process decreases the carbon content within the matrix and increases Fe-Ni content relatively. Due to this compositional variation, the initially non-ferromagnetic steel become ferromagnetic. The appearance of ferromagnetism depends upon the depletion of Cr as well as Cr/Ni ratio in the matrix. As the Cr depletion due to oxidation was more for the present tube, only the outer surface was magnetic. To make inner layer ferromagnetic, more carburisation and hence longer period of service exposure is needed. A probe was developed to measure magnetization by non-destructive way. Using this technique the magnetization was measured at different locations of the tube at two different frequencies to get different depth of penetration (figure-7). Difference in output signal at two different frequencies indicated the feasibility of the technique to measure the magnetic property due to carburisation of the tube. Fig 8: Magnetic induction at two different frequencies at different locations of service exposed tube by using magnetic NDT technique. The process heater tube used at a high temperature (1100 °C) for 2 years in the refinery units has been investigated. The virgin tube was found nonmagnetic. However, service exposed tube was found magnetic. The depletion of Cr in the matrix due to long-term service was the cause of ferromagnetism in in-service tube. The appearance of magnetism can be used as a NDT tool to assess the quality of the in-service. B.A.Senior, Materials Science and Engineering, vol. 103, 1988, p.263. D.C. Jiles, J, Appl. Phys,. 1988, 63,2980. A. Mitra, A. Joarder, O.N. Mohanty and V. Rao, Metals, Materials and processes, 1995, vol. 7, pp. 185-190.